Hubei Museum is near the East Lake and tourists can pay a visit by the way to the lake. It displays various cultural relics unearthed in Hubei such as ancient bronze items, lacquer ware, weapons and modern decorations. Despite the small size of the museum, there are many objects that have precious historical value and are quite worth visiting. Chimes of Warring States Period The 64 chimes were excavated from a tomb of Zeng Houyi, which dates back to 430 BC in the Warring States period, at Suizhou in summer 1978. They were hanged on the chime-frame in 3 layers and 8 groups. The largest bell is 153.4 cm tall and weighs 203. 6 kg. And 2, 800 characters on music were engraved on it. The set of bells are 1, 800 years older than that found in Europe. The finding is significant to world music history and is very rare in world casting history as well. The performance by the chimes still sounds very accurate and graceful even today. 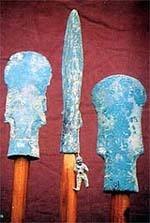 Sword of King of Yue The sword was unearthed in 1965. It was used by Gou Jian, king of the State of Yue during the Spring and Autumn Period (770BC-476BC) when he led his troops conquering the State of Wu. The sword was decorated with black patterns and the blades are still thin and sharp even today. 28-Constellation Painting It was painted on a lacquer case unearthed from the Zeng Houyi Tomb. The 28 Chinese characters symbolizing the 28 constellations were written on the cover of the case and dragons and tigers were drawn on the sides of the case. It is the earliest of its kind ever found in China. Bronze Cold-Drink Pot It was obtained from the Zeng Houyi Tomb that is 2,400 years old and is the earliest cold-drink pot ever discovered in China. The outer bronze basin is 61. 5 cm tall and weighs about 170 kg. Inside is a square bronze pot. Ice would be put in the basin just around the pot while icing the drink. It was a popular article for noble families to get cold drink in hot summer in ancient times. The museum neighbors the West Lake in Jiangling District of Jingzhou. It was built in 1958 and covers about 4 hectares. 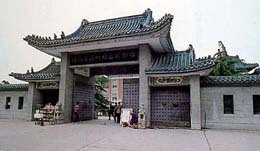 The museum houses more than 100, 000 cultural relics including silk of the Warring States Period, jade objects of the New Stone Age, bright lacquer ware of the State of Chu, swords of the king of the State of Yue, crossbows trigger, bamboo slips and wooden tablets for writing of the Han Dynasty, a well-reserved corpse of the Western Han Dynasty and hundreds of other precious items. Corpse of Western Han Dynasty It was unearthed from the No. 168 Western Han Dynasty tomb on the Phoenix Hill southeast of Jinan City in May 1957. It was a well-reserved corpse of a man and he was assumed to be a county magistrate and was buried in 167 BC, more than 2,000 years ago. He was thought to be in his 60s, weighing 52.5 kg and 1.678 m tall. It is the earliest male corpse ever found in China and the world that has been kept intact. The joints were still moveable when the corpse was excavated and the tissues such as the skin was still soft. When it was dissected, the meninx blood vessels were still very clear and the 12 pairs of cranial nerves could even be recognized. Swords of King of Yue Four swords once used by the king of the State of Yue were found in a tomb of the State of Chu at Jiangling. Patterns of birds and ancient Chinese characters were engraved on the swords, indicating they were worn by the king himself, but the fact that they were buried in the tomb of the State of Chu shows that they must be got from prisoners of war. Silk of Warring States Period The silk housed in the No. 1 tomb of the State of Chu at Jiangling dates back to the Warring States Period (475BG221BC). These silk products have diversified varieties and patterns with superb craftsmanship, the oldest and best of its kind in the world. Located on a mid-river isle near Yichang, it is an institute for artificial breeding of Chinese sturgeon set up in 1982. Chinese sturgeon is a rare species of fish that is as old as dinosaur with a history of 140 million years and is called "life fossil" under state special protection. An adult Chinese sturgeon can be 4 m long and weigh more than 500 kg, the largest of the 27 sturgeon species in the world, hence the name of "king of fish". Artificial breeding can produce 600,000 fries every autumn. The site used to be the Hubei Consultation Building that was built in 1909 at the north end of the Wuchang Horse Viewing Land. When the Wuchang Uprising succeeded on October 10, 1911, the revolutionary government was set up here and the Republic of China was announced to be founded. The two-story building is a brick-wooden structure and has a stone cave 73 m wide and 24 m deep. In front of the building is a statue of Dr. Sun Yat-sen.